My sister says I have ADD with my blog backgrounds. I tell her I’m about to get M-ADD & she’ll be S-ADD if she keeps talking smack. We’ve made up. Come on in here and join me for some coffee. 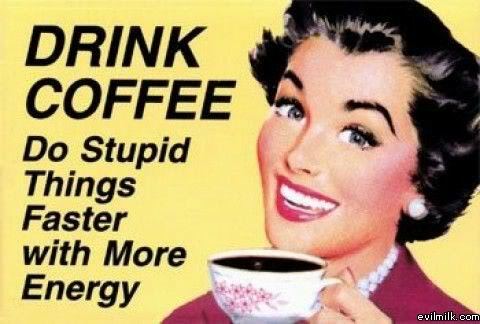 Ohhhhh, okay, I don’t typically drink coffee. When I feel the need to appear sophisticated (or when I am dying of thirst and anything will do- toilet water, dog drool, coffee…), I will get extremely large quantities of Hazelnut Carnation cream, several packets of Splenda & a squirt or two of coffee and mingle like a life-long coffee addict. As a young girl, I would mimic my grandmother drinking coffee with my mug of Coke and laugh politely at my imaginary friends’ jokes. Subconsciously I must want so badly for people to think of me as one of those “gotta have my coffee” girls. It’s true that when I am mingling with the fancy, intellectual coffee drinkers, I have to fight the urge to flash a fake smile and say things like “I am just a BEAR when I don’t have my coffee” or “I’ve gotta have my coffee fix!” The truth is I have a secret addiction to Big Red. They don’t put those in giant containers in churches, car dealerships, hotels or conferences, so I have to keep up my charade if I want to maintain my sophisticated image or quench my thirst for free when away from home. It’s not working? If you are from Texas, have you completed your good Texan duty and taken pictures in the bluebonnets yet?? Because Chris wasn’t feeling well yesterday, I took the boys to a local bluebonnet field to take pictures of the boys by myself. If he had been with me, it would have been a lot easier to attach the super glue (which DOESN’T work on dirt or plants, it turns out) to their behinds. They weren’t feeling me when I said, “Sit still right here for 30 minutes straight and give me a genuine smile at the same time while not moving or talking or pointing at the playground in the distance”. I was able to get one decent picture of Austin. If you were to wait until the end of this week to take your pictures, you would probably arrive to find a lonely bluebonnet begging you not to squat your big behind right on it’s head. “I’m the only one left! !”, he’ll sob. After he regains his composure, he’ll ask for some privacy to grieve alone. I actually laughed out loud when we arrived at the field of black-and-bluebonnets, which sounds so, so callous, I know. There were empty patches everywhere, decapitated flower stalks, smushed flowers looking to be given a hand… Apparently, it is necessary to camp out in that field in the days before the bluebonnets spring forth so you can be the first in line to plant your behind & your children’s behinds in the bluebonnets’ faces. On top of the bluebonnet carcasses, there were lots of Madisons and Cadens being placed “just right” all over the field. It was tricky trying to get a picture of my two uninterested boys in a picture without someone else in them. Perhaps it wasn’t the ideal setting, but the flowers that remained were beautiful and the experience was fun. They look like they’re having fun, right?? Right?